April 9, 2010 (NEW BERN, NC) — “Blue Tie: One Night, One Cause,” an evening of live dance music, food, cocktails, and an auction to be held April 17 at the Hilton Riverfront Hotel in New Bern, continues to acquire new sponsors and in-kind donations from companies and clubs to benefit children and adults with disabilities. The fundraising event is presented by RHA Howell, Inc., a non-profit organization serving people with disabilities state-wide. New “silver” sponsors include Carolina East Health Systems in Vanceboro, NC, a locally owned and operated health care organization, and Coastal Physical Medicine & Rehabilitation Service of New Bern. New “Blue Tie Buddies” include BSH Home Appliances Corp. and Faith Prayer House in New Bern, and PCS Phosphate in Aurora, NC. AccuCopy of New Bern is supplying free printing services for the event and the River Bend Garden Club will provide centerpieces for the dining tables. “Blue Tie: One Night, One Cause” will feature live dance music by recording artists Jim Quick & The Coastline Band along with fine dining and cocktails catered by the Hilton. The auction will include entertainment packages such as a Daytona 500 trip, a Halloween Weekend in New Orleans, and Jimmy Buffet tickets, along with other items. Dress is “sassy cocktail” and the best blue tie wins a prize. All proceeds will benefit a child or an adult with a disability in RHA Howell’s Tar River Center in Greenville, the Greenville Group Homes, and the River Bend Center in New Bern. Tar River Center in is a pediatric unit supporting 30 medically fragile infants and children with disabilities. The Greenville Group Homes provide quality care for children and teenagers with developmental delays and special needs. The River Bend Center is home to 125 children and young adults with developmental disabilities. 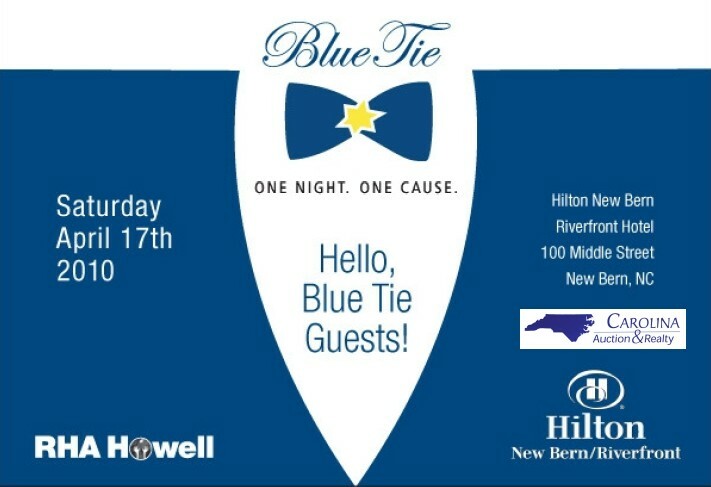 Doors to “Blue Tie: One Night, One Cause” will open at 6 p.m. To order advance tickets and to learn more about RHA Howell, Inc., go to www.rhahowell.org or call event coordinator Debbie Valentine at 919-803-2690.